New Orleans artist Bryan Brown—of Axiom Art Gallery on Freret Street—was selected as the creator this year’s official Tremé Fall Fest poster. The final design was unveiled on Wednesday, September 27, as part of the kickoff for the third annual festival happening this weekend. The festival takes place Saturday, September 30, from 11 a.m. to 7 p.m. on the grounds of St. Augustine Church with Friday and Sunday events to be included in the weekend festivities. Proceeds from the festival will benefit the iconic church. 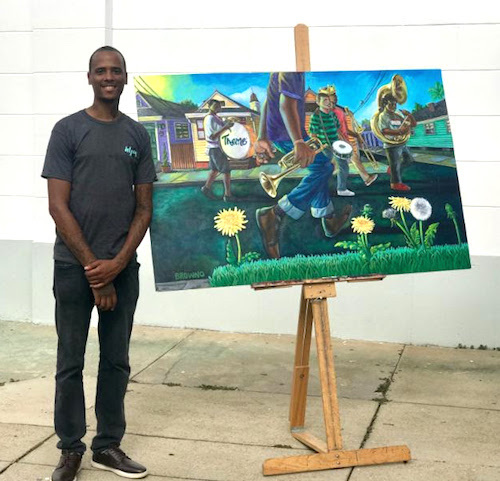 Local artist Bryan Brown, member of Axiom Artist Collective and part owner of Axiom Art Gallery on Freret Street, spoke about his involvement in the project. Hosted by HFTA, the Third Annual Tremé Fall Fest aims to showcase and celebrate the music, food and arts that are the foundation of Tremé’s rich and vibrant culture, and to raise funds to support the architecture, culture, and history of Tremé. The festival festivities are free and will include events from Friday, September 29, to Sunday, October 1. To learn more about the Tremé Fall Festival, donate, or purchase the official poster, visit www.tremefest.com.